All have been great machines but they have been lacking. The Dell m1330 has the audio jacks on the front edge, which makes using headphones on the couch an impossibility and the plasticy bits are glued/taped on, lots of power and battery life. The MacBook Pro is missing an SD card slot, the battery life is mediocre but the MagSafe connector and overall industrial design are winners. The Lenovo is a tablet which means it’s overpriced and under powered, it’s a good solid machine. The Asus EeePC has great battery life, but it is too small the keyboard is tiny. I really like the MagSafe connector on my MacBook Pro. It has saved the laptop from an excessive number of falls (though the frame is now dented and bent from the few falls it’s had). I was wondering why we haven’t seen other manufacturers attempt to innovate around the power connector. Sure the easy answer is because Apple owns a patent for a Magnetic connector for electronic device. However, there are other patents with similar ideas and different implementations. 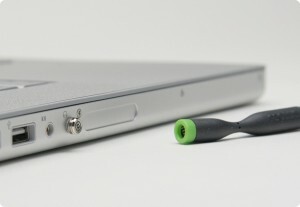 There is the Replug connectors for headphones (see photo). This combined with the MagSafe connector would provide break away connections for the 2 items often plugged into my laptop. It’s a look at the future of laptops. As much as I like hardware hacking, I’d rather not have to hack my power connector with a DIY solution (which is strangely similar to my desire to not add aftermarket products to a car).